Water kefir is a great way to kick the soda habit, and an easy way to get more probiotics into your diet. My kids like it better than kombucha, because it has a milder, less acidic flavor. (Compare water kefir and kombucha.) There's still a certain muskiness to it from the fermentation. You're not going to pass this off as regular soda, but it makes a nice, naturally carbonated option for those of us who avoid sugary drinks and artificial sweeteners. Once you purchase your grains, you should be able to continue culturing indefinitely. It's much cheaper than buying soda or carbonated water, and healthier, too. You can use filtered or unfiltered water, but you must avoid chlorine, nitrates and other toxic compounds. These are bad for both you and your kefir grains. I use our unfiltered well water, which is high in minerals. If you use filtered water, such as RO water, you should add back in some mineral drops. Alternatively, you can add a pinch of sea salt, a pinch of baking soda and a clean shell from a pastured egg. When I first started brewing, I always added the egg shell, but later I found out too much calcium will make your kefir grains slimy and your brew stinky. When brewing your water kefir, it's better to use less refined sugar because the trace minerals feed the kefir grains.Don't use honey, because it is naturally antibacterial and may negatively affect your kefir grains. The flavor of rapadura sugar was too strong for our family (at least so far). My sons didn't care for palm sugar, either, although I thought it worked just fine. Lately I've been using Florida Crystals, which are less refined organic cane sugar. 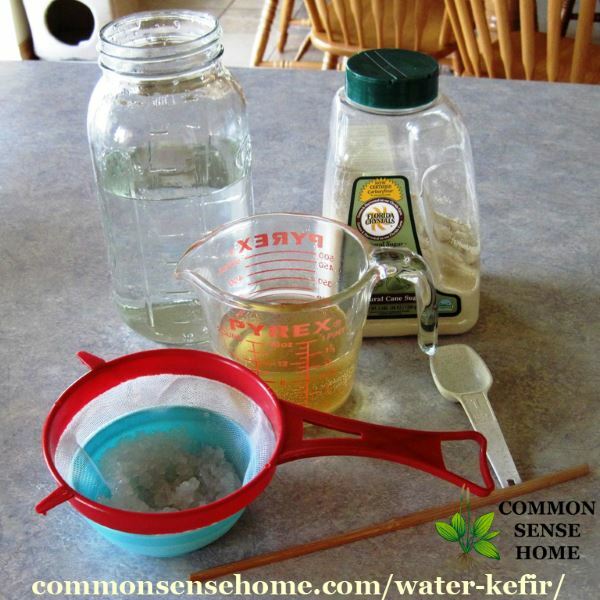 To make one quart of water kefir, dissolve 1/4 cup sugar in one cup of warm water. Mix in the rest of the water. Check to make sure the liquid isn't too hot, and then add the kefir grains. We'll typically mix the sugar and water in a pyrex cup, then pour the sugar water in a quart mason jar and fill the jar to near the top. Cover and let sit, out of direct sunlight, for 24-48 hours. When the ferment is finished, I strain the grains out and transfer them into the next batch, or into some sugar water in the fridge. I've tried holding a finished brew in the fridge, but to me the flavor becomes less pleasant as it sits with the grains in. It's best to culture it out every 24-24 hours to keep your grains happy and healthy. After the grains have been strained out, you can flavor the finished brew. Some of our favorite water kefir flavors are listed below. If you need water kefir grains or other home fermentation supplies for water kefir or kombucha, I highly recommend Kombucha Kamp. 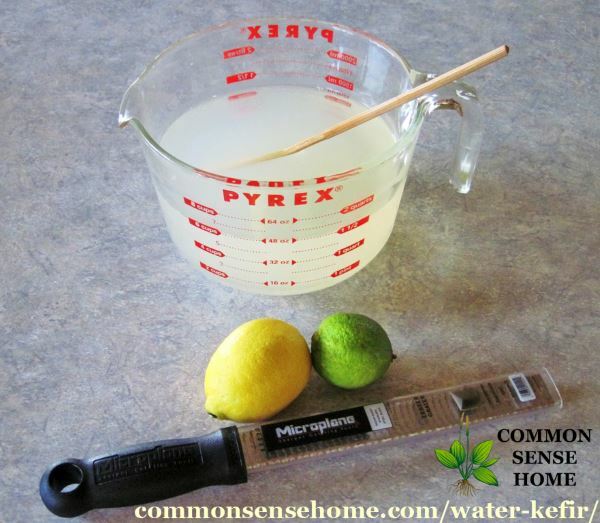 For lemon-lime water kefir, I use the zest and juice from one lemon and one lime (preferably organic) for five to six cups of water kefir. I like to zest my citrus with my microplane grater. (Thanks to my friend, Julie, for this handy gift). I add the juice and zest, give it a mix, and cover and let it sit on the counter top for another day. Shortcut Lemon Lime water kefir: While I love the depth of flavor I get from the fresh fruit, sometimes I just want something QUICK! So, I bought a bottle of organic lemon juice and organic lime juice, and use two tablespoons of each per quart of finished water kefir. Vitamin C is light sensitive, so you have better odds of getting vitamin C in your drink when you use the fruit and keep your bottles covered, but in this case my main concern is the probiotics. For raspberry lemonade water kefir, I use the juice and zest of one lemon along with a handful of fresh or frozen raspberries, lightly crushed. We've found another fun flavor combination that we like a lot. To each quart water kefir, add 1 cup orange juice and 1/2 cup syrup from homemade canned peaches. This one is really good! I love this because the kefir ferments the sugar into bubbles, so you get less sugar but all the flavor. I think this would be a great way to use the syrup from other home canned fruits, too. If you've got a juicer, you could substitute fresh peach juice for the peace syrup, in season. I've also tried various fruit juices. 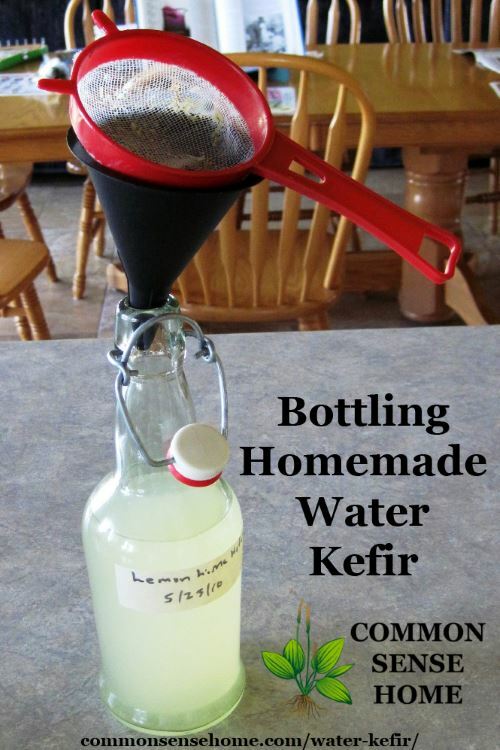 The I Love Water Kefir group on Facebook has some creative ideas, too. The strangest combo I've tried to date is pomegranate juice with nettle and rose hips. The flavor was a pleasant twist on an herbal infusion. 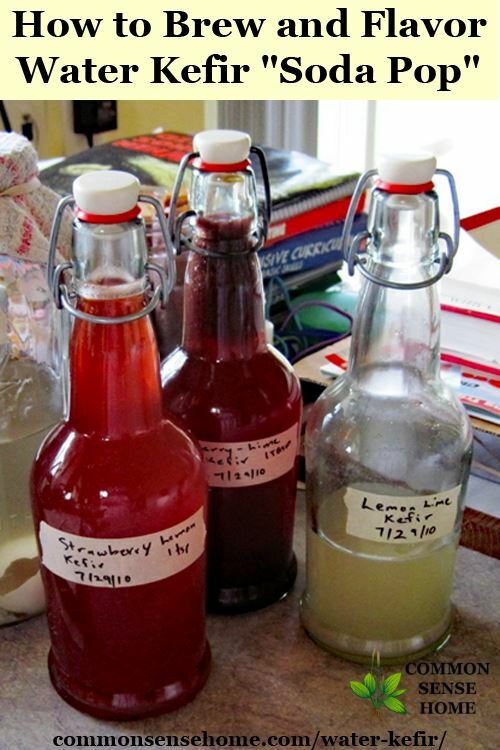 When you're ready to bottle, strain out any fruit or herbs bits before bottling. I like to place a small strainer right into my funnel as I fill. I purchased my bail top bottles locally at the House of Homebrew, but they are available online. (Click here to order a set of bail top bottles.) I write the flavor and date bottled on masking tape and stick it on the jar to keep track of my various brews. The more sugar in your second ferment, the more fizz you're likely to get. My lemon lime batches don't tend to get too fizzy (unless it's warm or they sit a long time), but the raspberry lemonade and fruit juice batches can get quite explosive. See the bubbles? Leave these too long or leave them in a warm place, and you'll have a geyser. I still have a bit of raspberry stuck under my cabinets from a crazed bottle of kombucha. 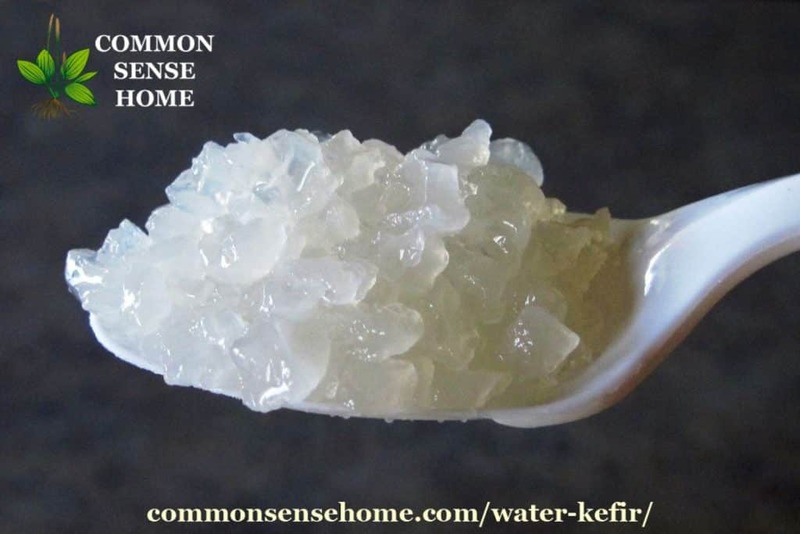 Have you tried water kefir? What flavors do you recommend? Any other tips you'd like to share? Originally published in 2010, updated in 2017. So Laurie…..what are your thoughts on water kefir versus Kombucha? More beneficial for you or not…Kelly really didn't give much info as to why other than Kombucha can taste different per batch and you have a scoby to deal with. Pamela – I was going to address that in this post, but it was already getting pretty long. I think both have benefits (and consume both of them most days). I'll have to do another post with my thoughts on that topic. I had a great run with water kefir this past summer (as you may remember with all my FB pics, LOL). I tried almost every herb in my cupboard as flavoring. My absolute FAVE flavor was basil. I just crushed fresh basil leaves into the fermenting kefir and it was SO refreshing! I also liked rose hips and hibiscus. Yum. I had a problem near the end of summer in which my kefir began to taste excessively yeasty and I hated it. I ended up throwing out the last three batches, I think. Right now, they are in a sugar bath in the fridge, but I don't know if they'll last in there all winter. There's no way I could brew a good batch anymore as our house never gets above 62 in the winter unless we leave all the heaters on full time, which we can't afford. I may end up buying new grains next summer anyway so I can start over and hopefully not get such a yeasty flavor. Oh, I miss water kefir! I was also having a problem with them tasting too yeasty. I rinsed them and put them in the fridge to rest for a few days and rinsed them again when they came out of the fridge after 4-5 day and they were back to regular without much of a yeasty flavor. My house is very cold and I was leaving them an extra day because of it and I think that is why they got that way, or I had too many grains in the jar or a combo of the two. Anyway I was reading a lot about sprouting mats and heat lamps for them because it is to cold in some peoples houses. Well just the other day I bout a regular desk lamp and I currently have a 40 watt regular light bulb in it and I leave it one overnight kinda shining on the WK bottles. I cover them with a cloth as they are supposed to like the light but that seems to have made a difference. I also bought 60 watt light bulbs in case the 40 wasn’t enough but the 40 seems to be enough heat for the cold night. I live in a cold area it is snowing today. We keep our heat set at 60 when we are home during the day or at 50 when we are not home or at night when we are sleeping. The light seems to be enough that I don’t think I can leave it for a whole 48 hours. Probably somewhere between 36 – 48 hours for my first ferment. Good luck I hope this may help! 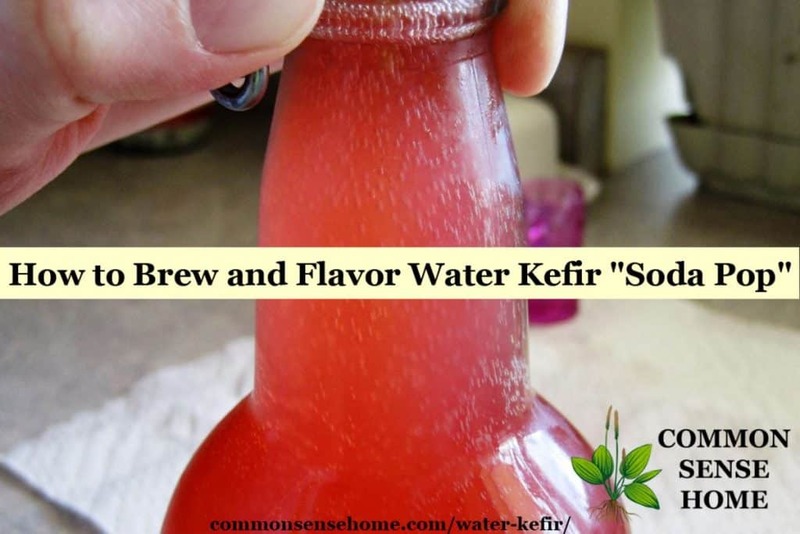 Water Kefir has been such a fun experience with the quick brew compared to kombutcha and all the fun flavors I have tried and I have a ton more to try. For milk kefir, I’ve read that the yeasts take over with too much time fermenting. It’s obvious with milk because of the curdling, but I would hypothesize that even with water kefir, either a shorter (or cooler?) fermentation would keep the balance better. I hope I’ve just successfully transformed my excess milk kefir grains into water kefir grains. I’ll try my first ‘second fermentation’ for drinking with some dried elderberries tonight. Y – my kefir always has a little bit of a strange taste. I've never tasted any other, so I'm not sure if it's supposed to taste that way or if it's just our well water (we have a lot of sulfur). I'm thinking of trying filtered water and adding minerals, just to avoid the sulfur. That's why I like the citrus blends. I find if I rinse my grains with each batch it helps keep the flavor milder. When I tried adding dried fruit to the first ferment it really gave an "off" flavor – like bad wine. I had to throw out the batch. 62? Brrrrr….. We shoot for around 65 to 67, and my feet still get cold. 🙂 My brother keeps his kombucha on top of the TV to keep it warm, but I imagine that only works if you watch TV regularly. Now I'm getting thirsty. Time to hunt down some of that kefir. Still haven't ordered kefir grains, it sure would save me money to make this recipe rather than buying the kombucha drinks. I'll bookmark this page so I can come back to it when I get my grains. Thanks for the info. What a great post! I've been wanting to start my own water kefir for some time but haven't been quite sure where to begin. This tutorial really helps! bookmarked! Thanks for linking up Laurie! Make a warming box for those of you that can't keep it warm. A plywood box about 2 ft square with a standard wall thermostat and light bulb inside. I have been using this for some time for my kefirs and cultured veggies. We also do food fermenting and works well for all. I stopped by your blog to grab your link. I have read this post before, but unfortunately I haven't made it myself yet. This a good post explaining it. I tried the vanilla extract, but I think our well water is too strongly flavored, so the vanilla was not enough to mask the well water taste. If anyone is having difficulty finding a plastic strainer here is a suggestion..If you are sprouting seeds with the jars that have the plastic tops with various size openings for different seeds you can use those as a strainer. Just turn the top upside down on top of the jar and pour slowly. Since the lip is upside down it will help keep the grains from spilling over as you pour but you will need to do so slowly since the lid can slide off the top of the jar. Not the best solution but will work if your like me and can't find a plastic strainer locally and already have your grains. When needed I use a Styrofoam box with a bath towel placed in the bottom. I place one jar with my yogurt or kefir in the box and one or two jars filled with hot or very hot water. Screw the lids on tightly and wrap them jars with the towel and place something on top of the styrofoam lid that will keep it completly closed. Just refill the hot water jars as often as you need for heat in the box. I usually only need to do so every 12-16 hours. Not the ideal situation but this helps in a pinch when it is cold. Plus I got the Styrofoam ice chest at the dollar store for 2 bucks. Plastic strainers are available at Cultures for Health (link on the sidebar). That's where I got mine. Boy, it’s really hard to tell without seeing what’s going on. It wouldn’t hurt to try and bring them back to life – all you’d be out is a little sugar. I’m not sure I follow everything that’s going on. If you have water that has been kefired and it has sat more than three days, I’d toss the water. It gets skunky – at least mine does. How were the grains “held in reserve”? I know, I didn’t explain it very well. By “held in reserve,” I just meant they were in sugar water in the fridge. The friend who gave them to me gave me quite a few (maybe 1/3 c.?) and I just put about 2 T. in my first attempt. I did end up dumping it out and starting again with the grains I fed this morning. I’m so new to all this, ugh. Hopefully this second try will behave correctly. I’m eager to have some finished and ready to drink! They have a wonderful troubleshooting guide and a free kefir recipe e-book. I find that if we let ours ferment enough to get really fizzy, it also gets slightly alcoholic in taste. There is some carbonation when we drink it, but never soda like levels unless it’s starting to get that “kick”. I just want to encourage those who might get overwhelmed, that it can be SUPER easy. would this be a good drink for a type2 diabetic? Overall, it should be relatively low in sugar, especially if you age it for 48 hours and use a flavoring like the lemon-lime. It should also increase the number of “friendlies” in your digestive tract, which is also a positive. I see that you also use the short cut of lemon juice at times. I was wondering if you have ever had the problem of the water not getting bubbly. I started using a lemon juice after the first fermentation and after it ferments the second time with the juice it isn’t bubbly. Any thoughts? More sugar yields more bubbles, but my water kefir has never been really bubbly. I don’t think it likes our water (we’ve got well water with high sulfur). I just bought some Concentrace Minerals and am going to try them in combination with RO water to see if that works better. Do you add the fruits in when you are starting the fermenting with the kefir grains in? or do you add after they have been removed? Remove kefir grains, then add fruit, so you don’t get the fruit mixed with your grains. Over time the fruit bits will not age well if mixed with your grains. What are your thoughts about taking a shortcut and just putting some kefir grains (2 tbs) directly to a jar of store bought lemonade? I have so many grains that I thought I would skip the 1f and go directly to the lemonade. If you have excess grains, go for it. The main reason to not brew directly in something like lemonade is that you’re likely to get lemon bits stuck in with your kefir grains when you filter. Why can’t you directly first ferment kefir grains in fruit juice? If you had excess grains, you could ferment them directly in the juice. Over time, continued fermentation in juice may produce an off flavor to the grains, as whatever medium they’re fermenting in becomes part of the grains themselves. Pulp and other chunks from freshly squeezed juice tends to get mixed in with the grains, and will rot over time. You probably want to leave at least a little room at the top so that if you get carbonation and the liquid foams it has somewhere to go. Room in the bottle will no influence carbonation very much, if at all. Carbonation will be determined by how active the culture is. Did you have it in a tightly sealed container for the second ferment? That will help trap the carbonation, but over years of brewing mine hasn’t always been consistently fizzy. As the grains become more active, the fizz level tends to improve. It’s best to keep brewing for a while to make sure the grains are fully active before storing, if possible. You can leave them up to a week in the fridge in a sugar solution, but using them regularly is best for the health of the grains.